The Great Horned Owl is the largest owl to live year-round in Kansas. Adults weigh around 3 - 3 1/2 pounds and have a 5 foot wingspread. There are nine other species of owls that are known from Kansas, ranging in size from the tiny Northern Saw-whet Owl to the Snowy Owl, which is slightly larger than the Great Horned Owl. Both these species are winter visitors only. 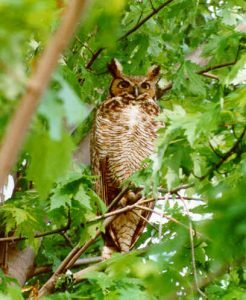 Year-round residents include the Barn Owl, Barred Owl, Burrowing Owl, Eastern Screech-Owl, Long-eared Owl and Short-eared Owl. The Western Screech-Owl may possibly be found in the extreme southwest corner of the state. 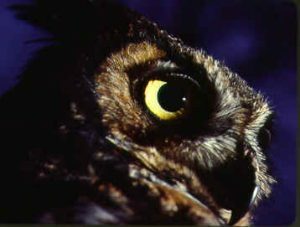 The food of Great Horned Owls is primarily large rodents and rabbits, but they can take prey as large as skunks. Various reptiles, amphibians and fish have also been reported in their diet along with large arthropods. Like all birds of prey, they use their powerful feet and sharp talons to subdue and kill their prey. The grip of the Great Horned Owl is believed to be more powerful than any other North American bird of prey. Owls cannot digest hair, bones or feathers. They regurgitate this part of their food as a pellet, which is usually about half the size of a man's thumb. Owl pellets may be found by looking on the ground underneath favorite roosting spots. If you carefully pick apart an owl pellet, you will find evidence of the animal that made up its last meal. Researchers have often used this method to find out what species of small mammals live in an area. Does the dead of winter sound like a good time for a bird to go on the nest? It does if you are a Great Horned Owl! In Kansas, they may start laying their eggs as early as late January. They typically lay 2 or 3 eggs, which are white and unmarked. Incubation takes about 28 days, and the youngsters will fledge at 35 days. The young may be cared for by the adults for 5 months. Because it is so cold at the time of nesting, incubation begins immediately after each egg is laid. As a consequence the eggs hatch in sequence, which gives the first hatchling a size advantage over its siblings. If food is scarce, the largest will out-compete the others for food that the parents bring back to the nest and only one may survive. Where do they nest? 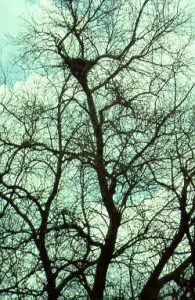 They will often use a former nest of a large bird such as hawk or a crow. Of course, they also like large hollow trees when they can find them. (That can be a real challenge on the Great Plains!) They do not add anything to the place they choose, but just settle in and start laying eggs. In order to find a mate and establish territory, Great Horned Owls do more hooting in winter than any other time. If you can do a passable hoot, it can be very easy to find out if they are in your neighborhood. Just go out some winter evening, cup your hands around your mouth and let out with as loud a hoot as you can manage! Wait a few seconds, watch and listen, and try again. If there are any in the area, they are very likely to take notice and hoot back or even fly over to check out WHO is new in their territory! Don't worry about what your human neighbors will think; just do it! In Wichita, if you visit the Kansas Wildlife Exhibit you can meet the two Great Horned Owls that reside there. One of them is always interested to meet people who hoot at him. He will often fly right up to the front of the cage and hoot back, which gives a good opportunity to observe the interesting body language that goes along with Owl Talk! Another way to locate owls is to listen to the crows. When a crow discovers a roosting owl it will raise a big ruckus that attracts other crows in the vicinity. They will fly over and join in, squawking and carrying on. Some brave (or stupid!) crows may even dive at the owl to further harass it. If the owl gets tired of all the unwanted attention, it may fly to a different perch, which REALLY gets the crows wound up. The volume of their calls goes up three or four notches and they usually follow the owl wherever it goes to continue the heckling. If you can catch up with this parade, you will locate one of your neighborhood owls (and maybe you can shoo the crows off so the owl can get back to sleep! ).